Forecasted environmental changes will alter the physical and biogeochemical processes operating on coral reef protected coastlines. In order to predict changes to these environments and consequent impacts on human populations and infrastructure, we need to develop an improved, process-based understanding of these complex dynamics and feedbacks. Tropical reefs are unique systems in that there is a strong link between the accumulation and transport of sediments and the ecology of the organisms responsible for their biogenic production (coral, algae, molluscs, etc.). Little is currently understood about sediment transport and shoreline morphology in coral reef environments, particularly in fringing reef systems where the reef structure blocks most of the onshore wave transmission. In order to quantify carbonate sediment transport it is necessary to measure the biological constituents and physical parameters of the sediments, as well as understand how sediments interact with the unique hydrodynamics of reef environments. There is a need for data and an improved understanding of the mechanics of transport processes that form and alter coastal landforms adjacent to reefs. 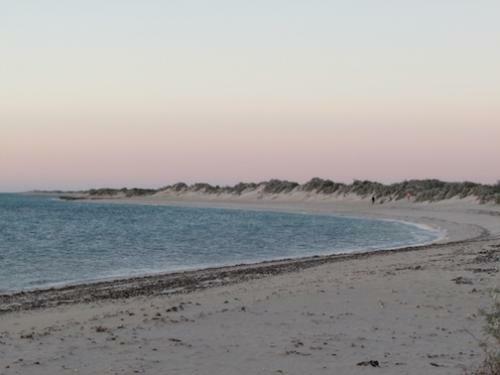 In this study, field, laboratory, and modelling approaches are used to quantify the key components of a carbonate sediment budget, using Ningaloo Reef, Western Australia as a case study. This budget analysis will give insight into the future changes in carbonate sediment production and cycling at Ningaloo and other fringing reef systems due to ocean acidification, sea-level rise, storm frequency and other issues related to climate change. This research will provide critical new insights into carbonate sediment production and cycling in fringing reef environments. Information gained from this study will help to refine our understanding of sediment transport pathways and coastal landform development in these environments. Furthermore, quantification of the key components of a carbonate sediment budget will prove crucial to predicting and understanding future changes to fringing reef systems due to climate change and ocean acidification.